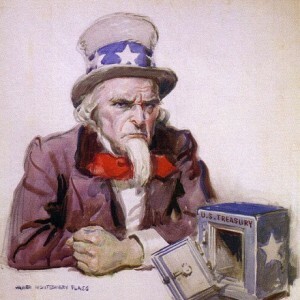 -The U.S. national debt has increased by more than 7 trillion dollars since Barack Obama has been in the White House. By the time Obama’s second term is over, we will have accumulated about as much new debt under his leadership than we did under all of the other U.S. presidents in all of U.S. history combined. This is not anywhere close to being sustainable, but most Americans don’t seem to care. They just continue to recklessly run up even more debt. Our nation has become an ocean of red ink from sea to shining sea, and the only way to keep the bubble from bursting is for the total amount of debt to continue to grow much faster than the overall economy is growing. Obviously this cannot happen indefinitely, and when this house of cards comes crashing down it is going to be absolutely horrific. 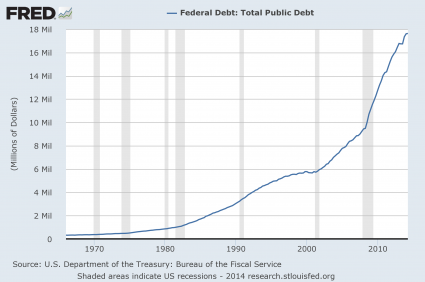 For much more on all of this please see my previous article entitled “The United States Of Debt: Total Debt In America Hits A New Record High Of Nearly 60 Trillion Dollars“. 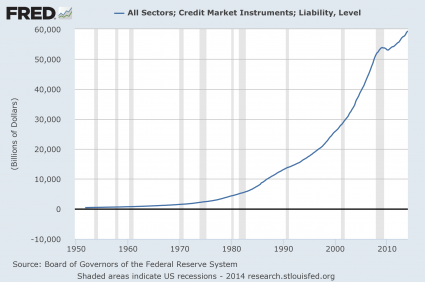 The big question is how long our “bubble economy” can keep going before it finally collapses. This has arguably kept the modern financial system as we know it a going concern. Clearly there have always been bubbles formed through history but has there been a period like the last 20 years where the bursting of one bubble has consistently led directly to the formation of the next? Most Americans just assume that since the politicians tell them that everything is going to be okay that they don’t need to be concerned about any of this.